Many of us are fond of the Royal Botanic Gardens Melbourne. The Botanic Gardens are a peaceful island south of the city, with wide sweeping paths and lawns, lush hills, tranquil lakes, rainforest fern gullies, wetlands, a herb garden, tropical glass house. 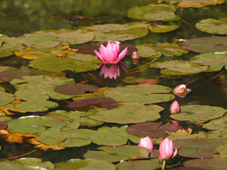 The Royal Botanic Gardens Melbourne is home to over 50 species of birds  over 40 native. There are blue fairy-wrens, red wattlebirds, lorikeets, cockatoos, herons, ravens, larks, willie wagtails, ducks and black swans. You can watch eels and turtles swimming in the lakes. If you are lucky you see the long necked turtles waddling across the lawns to build their nest in the garden. They are delightful with a long snakelike neck and small head. The size of the garden is impressive  you can stroll and linger for hours. It was established even before the gold rush in 1846 by one of the greatest botanists of the 19th century. He introduced a vast array of plants to the Botanic Gardens, which now features about 10,000 species from Australia and around the world. The gardens Herbarium holds a collection of over 1 million plant species. The stream is popular for water play - the whole place is generally alive with happy kids  with plenty of things to do and explore. You can bring a picnic rug and stay in paradise for the best part of a day. There is a cottage selling plant related handicrafts, a gardens shop, a gourmet restaurant and two cafés  one on observatory hill, the other at the lake. You can go on a variety of guided walks and tours, an aboriginal heritage walk, advertised on the map boards throughout the park. During summer there is an open air cinema on one of the garden lawns. On Observatory Hill you find the historic buildings of the first Melbourne astronomers. Occasionally the Gardens are mistakenly referred to as the Melbourne botanical gardens. They are called Melbourne botanic gardens only. From the city it is only a 10 minute walk to the Royal Botanic Gardens Melbourne. Walk across Princes Bridge. 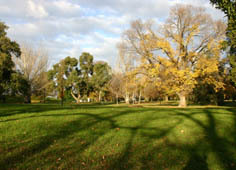 The Botanical Gardens are flanked by the Yarra and St Kilda Road.